Can someone help me with how I can get a joint placed at 0,0,0 and act like a rootMotion joint for a game Engine? I would like to have a switch on the Locomotion controller so that it stay with the world, or can move with the body. 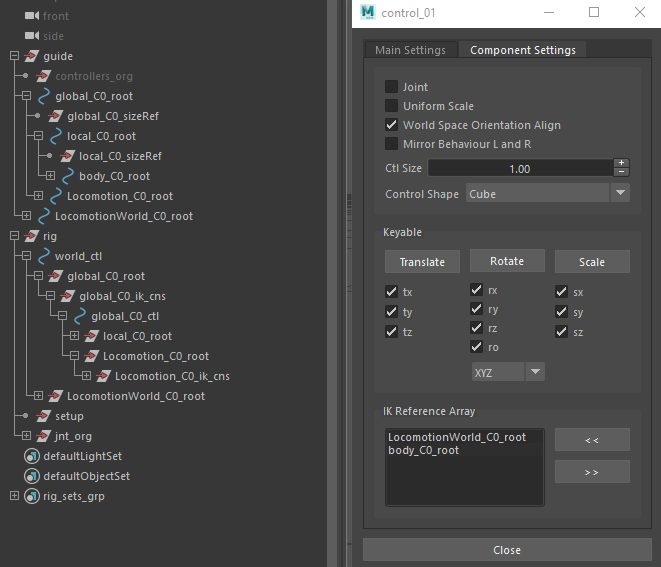 I don’t think there is a way to assign the world_ctl to the IK Reference Array of a control. You could make a dummy world control outside of the global control and use it as the world space reference. You can always turn off all the keyable channels on the dummy so it can only be moved by the world_ctl. I can’t seem to get what your showing here. Any chance you could supply a very simple maya file? Sure here’s a Maya file. Its built with mGear 3.0.5.